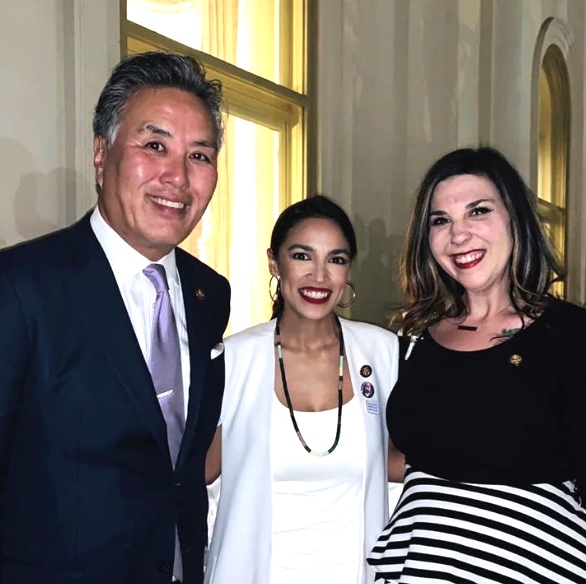 Rep. Mark Takano (D-Riverside), Rep. Alexandria Ocasio-Cortez (D-N.Y.) and Takano’s State of the Union guest, Shyan Lasater-Bailey, an air traffic controller affected by the recent shutdown. WASHINGTON — President Donald Trump gave his second State of the Union address on Tuesday before the House and Senate. Following are responses from members of the Congressional Asian Pacific American Caucus. Sen. Mazie Hirono (D-Hawaii): “We’ve had the reality of two years of the Trump presidency and their misplaced priorities ­— the Muslim ban, the separation of children [from their parents]at the border, the constant attacks on immigrants, trying to eliminate the Affordable Care Act, which supports health care for millions and millions of people, the sabotaging of the health care program, and of course the most recent, the shutdown, which hurt 800,000 federal workers, contractors, not to mention harming our entire economy. “That is the real Trump. So whatever he said tonight about bringing people together, in spite of the fact that he has been the most divisive president that I have experienced, it rang hollow. There is general acknowledgement that this is a president who doesn’t learn, who cannot change, so he can say all the nice things but really with this president it’s what he does. Sen. Tammy Duckworth (D-Ill.): “Tonight, we saw the same reckless rhetoric that has been a signature of Donald Trump’s presidency. Instead of attempting to unite the country and bring people together after the ridiculous and unnecessary government shutdown, the president played on America’s internal divisions and employed his usual xenophobic attacks on immigrants. “Instead of proposing ethics reforms to clean up Washington, he asked Congress and law enforcement to stop investigating misconduct in his administration – and he missed a critical opportunity to present credible, thoughtful solutions to some of the serious challenges facing our country like our crumbling infrastructure and rising health care costs. Rep. Judy Chu (D-Pasadena): “President Trump’s calls for unity tonight must be matched by his actions. In reality, there is no unity for families torn apart by his hateful Muslim ban or family separation policy. Dreamers are still being held hostage while Trump continues to wage war on immigrants by deporting TPS [Temporary Protected Status] recipients, further separating families. And his latest plan to use the military to spread xenophobia at our border is already further dividing communities. “The divide between the haves and the have-nots is growing under Trump as well, thanks to his continued attacks on the Affordable Care Act and women’s health, and his tax scam that was just a handout to the richest 1 percent. He has divided our national lands in order to enrich oil companies who profit from the destruction of our planet. And he has divided America from our allies by cozying up to countries like Russia. “Trump intentionally governs by division and misdirection. Tonight’s speech was an example of both. But Democrats will not lose focus on what matters: helping more families achieve the American Dream – a dream which must remain open to all, no matter where they were born. That means continuing our work to make healthcare affordable and accessible, creating more and better paying jobs, and protecting our environment for future generations. “We must also push back on his tactics of fear and division, like his border wall. He is ignoring the problems he claims to care about, like the opioid crisis. The fact is, the majority of drugs come through legal ports of entry and building a wall will do nothing to address the actual causes of the epidemic. Rep. Mark Takano (D-Riverside): “The state of our Union is weakened when the president of the United States taps into harmful, anti-immigrant rhetoric to push his unpopular immigration agenda. Tonight’s address confirms that President Trump and his administration are continuing to focus on fabricated crises, instead of prioritizing the issues Americans care about. 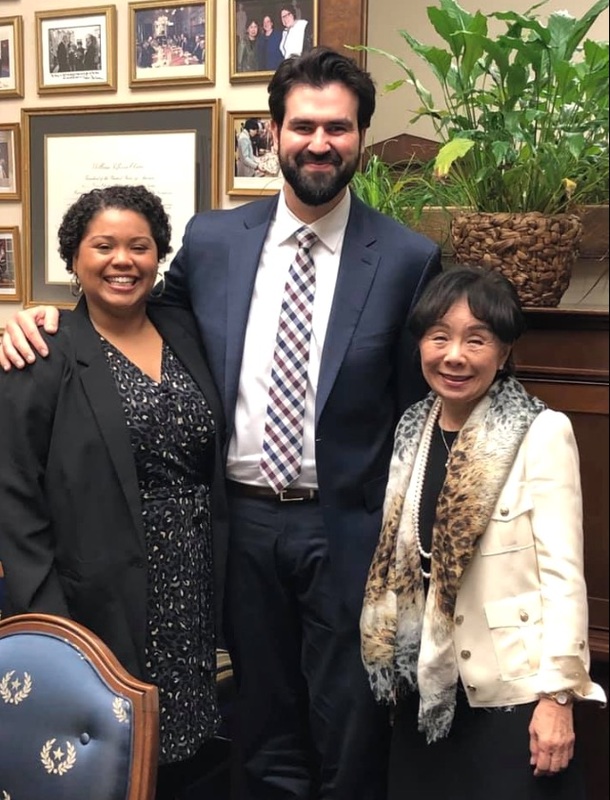 Rep. Doris Matsui (D-Sacramento) with her State of the Union guest, Jesus Limon Guzman, and his wife, Nellie. Guzman is a professor at Sacramento State University, a lecturer at Sacramento City College, and a DACA recipient. Rep. T.J. Cox (D-Bakersfield): “The American people deserve an honest conversation about immigration, about the skyrocketing costs of healthcare and prescription drugs, and about the increasing polarization in our country. More than anything, the American people were looking for moral leadership: how to stop unnecessary shutdowns and pay workers their fair wages, and move forward together with an agenda that puts the middle-class first. “Border crossings at 20-45 year low. Rep. Andy Kim (D-N.J.): “I came to Congress to deliver for the people of New Jersey’s Third Congressional District. If the president is serious in his calls for more bipartisan action, the time is now to show those calls are more than just empty talk. “We can work in a bipartisan way to lower prescription drug prices, take dirty money out of our political system and give power back to the people, address an opioid crisis that is crippling our communities and deliver for our men and women in uniform. We can tackle these challenges together with both civility and strength. Rep. Grace Meng (D-N.Y.): “President Trump addressed the American people this evening and spoke of a new era of bipartisanship coupled with lofty policy goals. I believe Democrats and Republicans can and should work together on issues like rebuilding our crumbling infrastructure and lowering the cost of prescription drugs. But the President will need to match words with deeds, and we will see if his desire for bipartisanship will align with his actions after tonight. “I stand ready to work with the president. But I will not stand for attacks on hard-working middle-class families, immigrant communities, and young people, and I will continue to fight against any proposals or policies that seek to harm them. Meng’s guest at the State of the Union was Jin Park of Flushing, Queens, the first DACA recipient to be awarded the prestigious Rhodes Scholarship. Park, 22, is a recent Harvard graduate and Define American chapter leader who won a scholarship for this fall at the University of Oxford in England. But since Trump moved to end the DACA program, Park fears that he will not be permitted to re-enter the U.S. if he leaves the country to study at the school.